So far it has been impossible to date beginnings of the Baptistery, one of the oldest architectural monuments of the city. At one time thought to have been a pagan temple dedicated to Mars, modern research tends to date its origins to the fourth century. Its geometrical decoration in green and white Prato marble results from a happy combination of Paleochristian and Romanesque architecture of the eleventh to thirteenth centuries. The exterior with its three-arched facades punctuated by pedimented windows and small series of three arches corresponds exactly to the interior articulation; this is accentuated by the marble decoration. The basreliefs and sculptures around the external doors are among the most important created in Tuscany. Their gilded bronze doors are by Andrea Pisano (present south door: 1336) and Lorenzo Ghiberti (north and east doors: 1427 and 1452). The latter is the famous "Gates of Paradise", one of the greatest achievements in Western sculpture uniting late Gothic rhythmic elegance with the newly learned classical language. The original has been removed for restoration and there is a copy in its place. 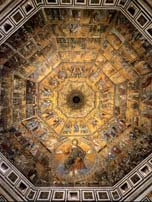 At present four restored panels can be found in the Museum of the Opera del Duomo. The marble groups above the doors are Francesco Rustici's Preaching of the Baptist and Francesco Danti's Beheading of the Baptist. 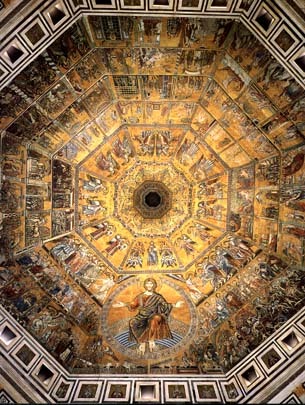 Inside, apart from the inlaid pavement of the turn of the twelfth and thirteenth centuries, are the wonderful large apse and vault mosaics on a gold background which were executed between 1266 and the beginning of the fourteenth century. The artists were Bizantine, trained from Venice, who worked with the more vigorous Tuscans like Meliore, Coppo di Marcovaldo and above all Cimabue (recorder 1272-1302), Giotto's master. Other works of sculpture here include the tomb of John XXIII, the anti-Pope who died in Florence in 1426. 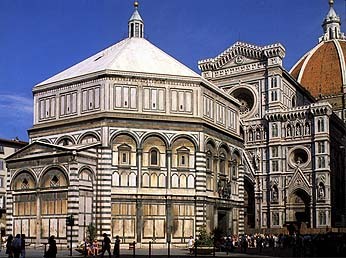 This was designed by Donatello and Michelozzo and the striking wooden Magdalen by Donatello from it is now in the Museo dell'Opera del Duomo. As a result of the restoration carried out after the damage of the 1996 flood, the gold highlights on this figure were revealed.